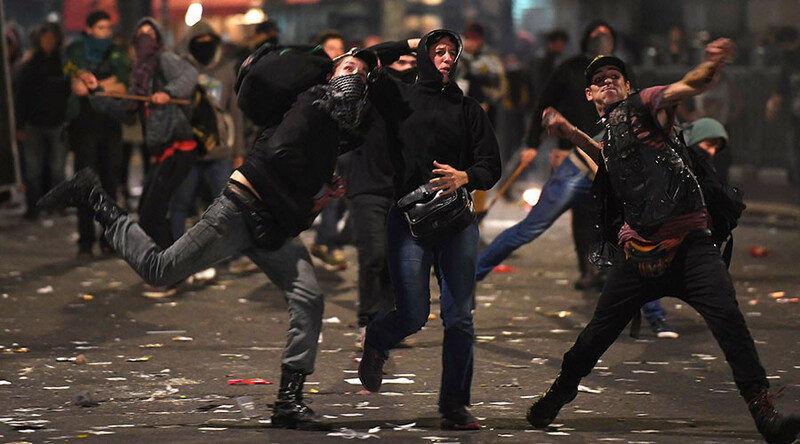 Clashes have broken out between police and protesters at a mass Buenos Aires rally commemorating the one-month anniversary of the disappearance of activist Santiago Maldonaldo, for which protesters blame the authorities. Sergio Maldonaldo, the brother of the 28-year-old missing activist, accused the right-wing government of Mauricio Macri of covering up Santiago’s “forced disappearance” during an indigenous land rights protest on August 1, and demanded the resignation of security minister Patricia Bullrich. 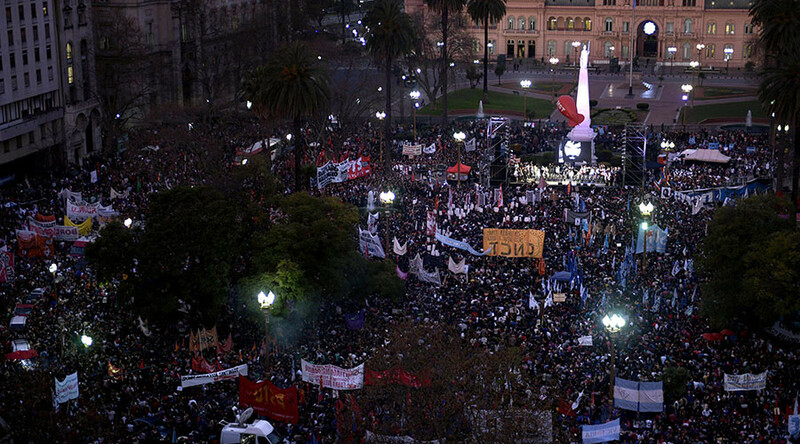 The demonstration was organized by opposition groups, trade unions, and more radically-minded street movements. As the speeches wrapped up, some of the protesters began to lob rocks at the police, and set up bin barricades which were set on fire. Riot police, armed with truncheons and shields, deployed a water cannon and fired gas pellets into the crowd to force it to disperse. Officials said that over 20 people were treated for injuries and 23 were detained. There was extensive damage to street furniture and buildings around the square, most of which were covered in graffiti left by the protesters. In the aftermath, cabinet chief Marcos Pena urged all political forces to condemn the violence and warned against the “politicization” of Maldonaldo’s ongoing case. Pena said that after a month-long investigation which has promised a $30,000 reward for any information on Maldonaldo, there is still no “concrete, reliable and certified” evidence that he was ever taken into custody. 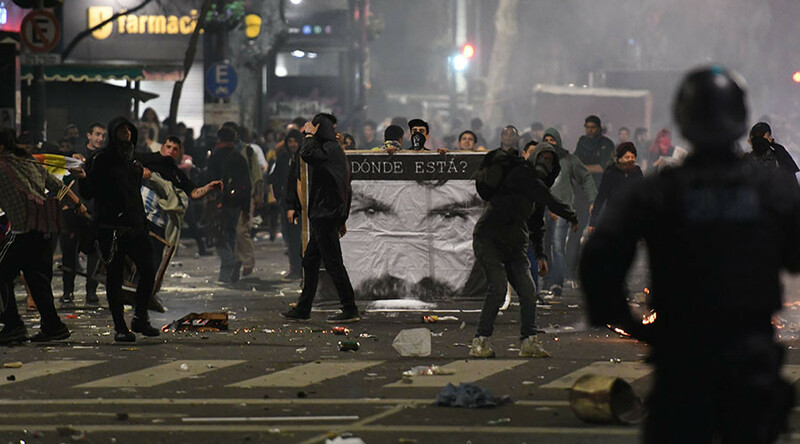 Maldonaldo, who lived in a hippy commune, and worked as a tattoo artist, was last seen during a protest by Mapuche Indians on a Patagonian wool farm, owned by the Italian clothing manufacturer Benetton. The protest was broken up by police, and fellow demonstrators say they saw Maldonaldo trying to escape from border guards, not to be heard from or seen again. Maldonaldo’s disappearance was given a boost of publicity by former president Cristina Fernandez de Kirchner, who mobilized the socialist opposition, demanding that Maldonaldo “must reappear, and must reappear alive.” Kirchner, who lost a bitterly-fought presidential race to Macri in 2015, is looking to make a comeback in next month's legislative election. Police abductions is a historically-loaded issue in Argentina, where up to 30,000 socialist activists and guerrilla fighters are thought to have “disappeared,” with the far-right government widely suspected of ordering the abductions during the so-called Dirty War between 1974 and 1983.